In the world of audio video the holy grail is a box that can handle all your media content and have full access to web content. Fortunately Sapphire has released just such a grail, the Edge-HD which has the potential to provide access to all your media and still have the ability to access both web video and handle light workloads as well and all this can be done via HDMI on your TV or VGA/DVI to a monitor. The Edge-HD has all the necessities for a portable media center or ultra low power workstation. Overall Sapphire’s Edge-HD mini PC looks to have the makings of an awesome mini PC with a ton of uses ranging from businesses to home theater. 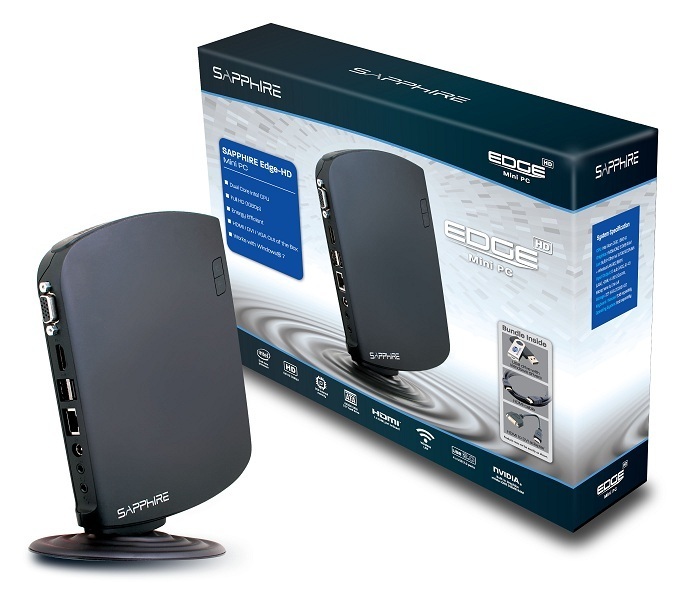 Join me while I review the Edge-HD mini PC from Sapphire. The Sapphire EDGE-HD Mini PC is the smallest PC in the world with its slim, stylish outline and less than half a liter in volume! A fully featured PC for home or business use it has 1.66Ghz processor, 2GB of memory, a 250GB hard drive, high resolution graphics output with a full HD (1920×1080) HDMI interface, wireless connectivity and 4 USB ports. Consuming only around 22W under load, the SAPPHIRE Mini PC uses 10 times less power than even the most efficient desktop PC – and less than many notebooks – making it one of the Greenest PC solutions available! I will be testing the Edge-HD with a variety of HD clips utilizing windows 7 media center as well as Cyberlink Power DVD and XBMC due to the usage of graphics acceleration. Beyond video I will also test the viability of light business usage utilizing Microsoft Office 2007 SP2 My primary focus is how well the Sapphire Edge-HD works as a media center.